I wouldn’t put my name on something that I wasn’t proud of,” expressed Matt Riggs on a brewery tour one Sunday afternoon. “I wouldn’t put my name on something that I wasn’t proud of,” expressed Matt Riggs on a brewery tour one Sunday afternoon. Brothers Darin and Matt Riggs dreamed of opening a brewery back when they were studying at the University of Illinois at Urbana-Champaign. Darin and Matt grew up on their family farm in Champaign County and knew that small scale farming would not generate enough profit to support their future families. To pay for college, Darin and Matt enrolled in U of I’s ROTC program and served in the military after graduating. After years in the military, Matt and Darin wanted to experiment brewing beers. The best place to learn about brewing, according to Matt’s German wife, was to go to Germany. Matt worked at Faust brewery in Bavaria, Germany before getting his brewmaster certification in Munich. Meanwhile, Darin attended UC Davis for a degree in master brewing. After completing their brewing education, Matt and Darin returned home to Champaign County. 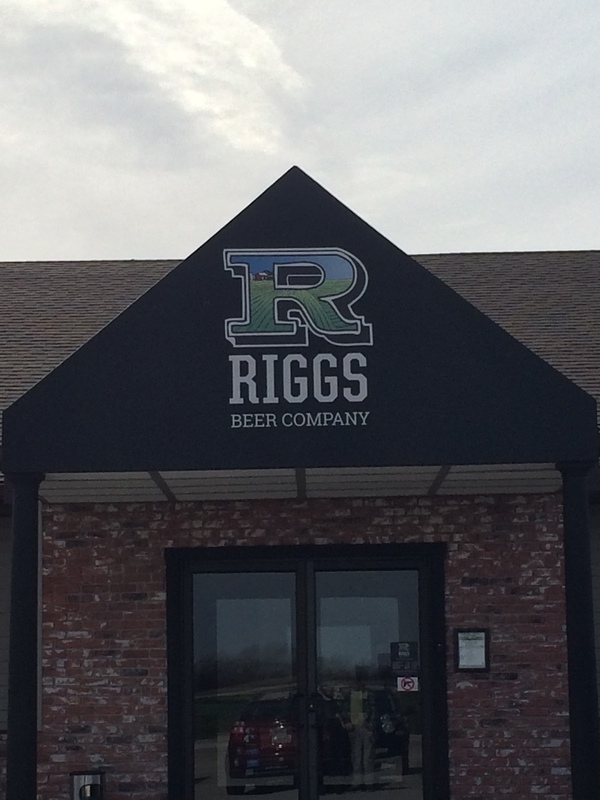 Riggs Beer Company opened its doors in June 2016 on the edge of Urbana on S. High Cross Road. 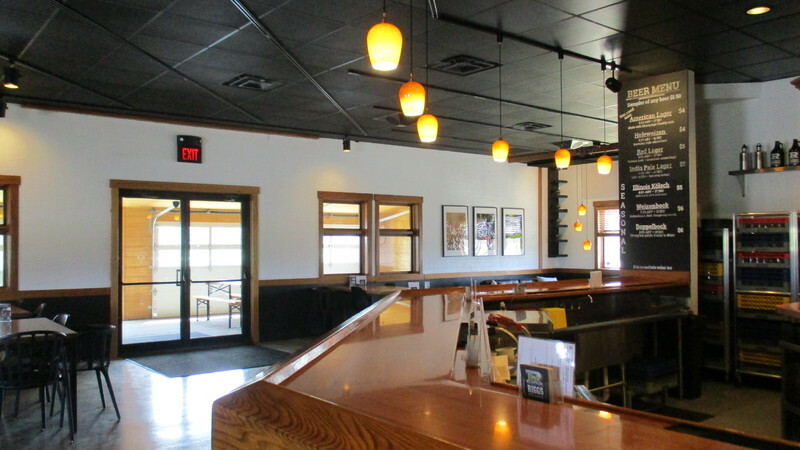 Riggs specializes in German Wheat and American Lager beers. Riggs Beer Company operates on a traditional German beer schedule: darker beers in the winter months and lighter ones in the summer. They have twelve special release beers throughout the year, as well as their four staple beers: American Lager, Hefeweizen, Red Lager, and India Pale Lager. They knew it would be a success even before they settled on a location because somehow a reporter found out they were scoping out the location on S. High Cross Road to open a brewery and was going to report on the potential brewery. The brothers quickly scrambled to make a website and promote their future business before an article was published. What makes Riggs unique is that the brothers continue their farming background by growing corn and wheat on location. They have been experimenting with corn and wheat varieties grown right at the U of I. The fields surrounding their brewery is filled with these new varieties. Riggs Beer Company entrance: Riggs Beer Company entrance on South High Cross Road in Urbana, IL. ~ Creator: Chrissy O'Grady ~ Date: Sunday, April 22, 2018 at 4:00 pm. 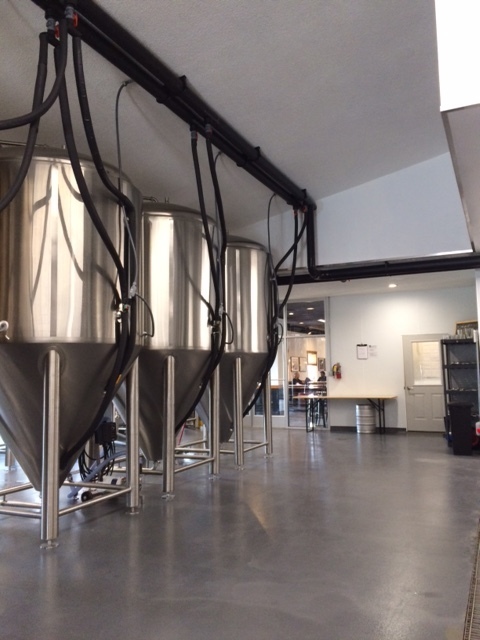 Stainless fermenters inside Riggs Beer Company. 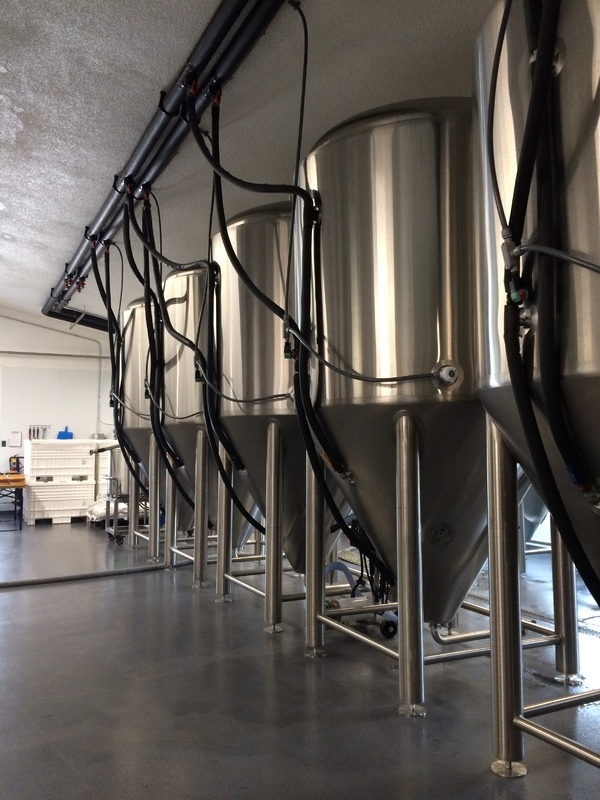 : Large stainless fermenters inside Riggs Beer Company brewing room. ~ Creator: Chrissy O'Grady ~ Date: Sunday, April 22, 2018 at 4:00 pm. Stainless fermenters inside brewery: Large stainless fermenters inside brewery looking towards tasting room and entrance to brewery. ~ Creator: Chrissy O'Grady ~ Date: Sunday, April 22, 2018 at 4:00 pm. Riggs Beer Company tasting room. : View of the Riggs Beer Company tasting room with bar and view of the patio. ~ Creator: Chrissy O'Grady ~ Date: Sunday, April 22, 2018 at 4:00 pm. Test fields that are to the south of Riggs Beer Company. 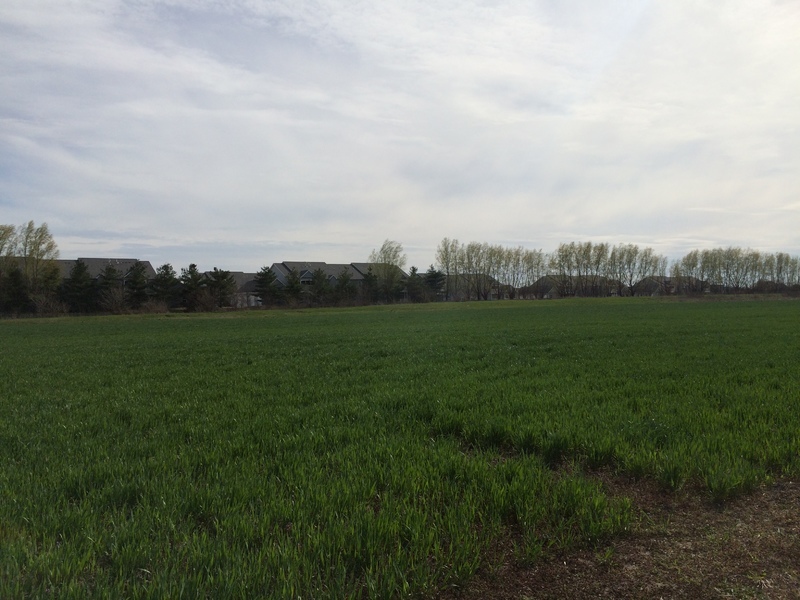 : View of the test fields to the south of Riggs Beer Company. These test fields contain wheat and corn varieties from UIUC. ~ Creator: Chrissy O'Grady ~ Date: Sunday, April 22, 2018 at 4:00 pm. 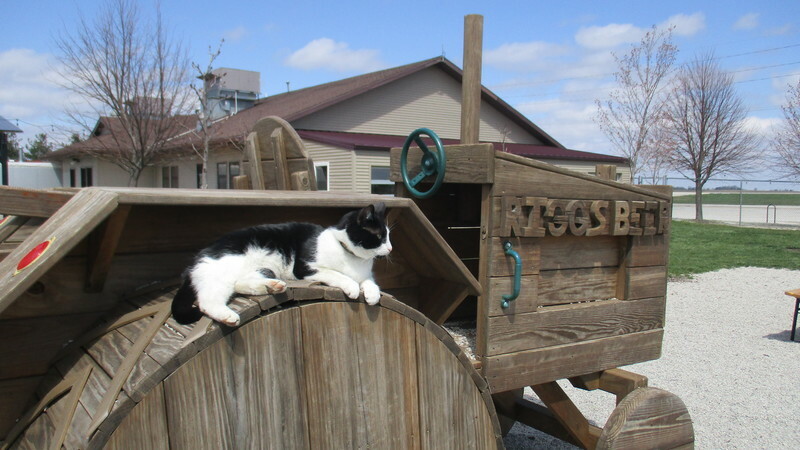 Riggs Beer Company Brewery Cat: Black and white brewery cat on wooden children playground in the Riggs Beer Company garden. ~ Creator: Chrissy O'Grady ~ Date: Sunday, April 22, 2018 at 4:00 pm. 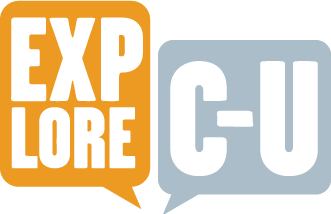 1901 S High Cross Road, Urbana, IL 61802 ~ From Urbana, take E University Street/150 east and turn right on S High Cross Road/ 130.
,” ExploreCU, accessed April 21, 2019, https://explorecu.org/items/show/421. Baer, Camille. “Riggs Beer Company Makes Final Steps to Become Solar Powered.” The Daily Illini. Accessed November 26, 2018. https://dailyillini.com/features/business-and-tech/2017/12/23/riggs-beer-company-makes-final-steps-become-solar-powered/. Jasso, Emilio T. “Riggs Beer Company Exceeds Expectations.” Smile Politely. Accessed November 5, 2018. http://www.smilepolitely.com/food/riggs_beer_company_exceeds_expectations/. “Our Story - Riggs Beer Company.” Accessed November 5, 2018. http://www.riggsbeer.com/index.php/our-story/. Riggs Beer Company. Interview by Chrissy O’Grady, 2018.